Surrounded by a precious band of bush and farmlands with natural springs and creeks, Buninyong's natural environment is one of its greatest assets. Along with several public parks and gardens in the town, it provides shelter for wildlife in a beautiful setting. However it is also very vulnerable to destruction by over-development and various forms of degradation. Several groups have been formed in the district to care for the natural environment and try to preserve the remaining parks and bushland areas, safeguarding their existence for future generations. The Bunanyung Landscape Alliance advocates for our environment on behalf of the community. A non-profit association, it aims to protect and/or enhance our land & waterscapes. 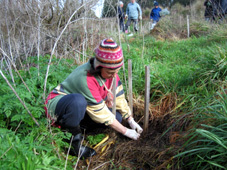 It is an alliance of community members, Landcare and Friends groups, networks and associations involved in promoting the health of biodiversity for the urban and rural catchments of the Moorabool, Leigh and Woady Yaloak, all which form the northern part of the Corangamite Catchment Area. This group was set up to save Royal Park from threatened housing development. It has converted the former Buninyong Football Oval to an area for environmental education with a thriving community garden and extensive revegetation. 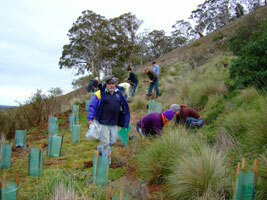 Many willing hands planted 500 indigenous shrubs and trees in banks around Royal Park on 21st June 2009. You can see the results on the eastern and western sides of the old football ground and enjoy watching them grow into handsome garden areas. The old Football clubhouse is now used as an environmental resource centre and can be hired out for suitable functions while the playing area is now shared with the Buninyong Redbacks Soccer Club. The Friends of Royal Park-Buninyong Sustainability also organise annual Sustainable Living Festivals here in Buninyong, at Royal Park, cnr Hedrick and Warrenheip Sts Buninyong. 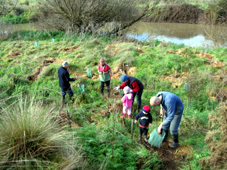 See Friends of Royal Park-Buninyong Sustainability for more info and updates on their activities. 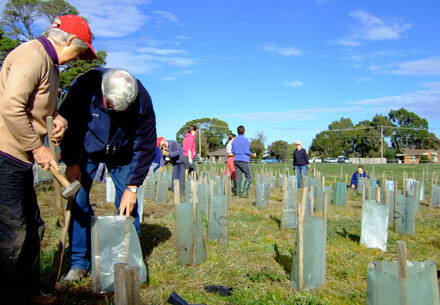 Several thousand trees have been planted by Landcare groups, often with assistance from pupils in local schools on School Tree Day. At Garibaldi Bridge Reserve, tree planters of all ages got together on what turned out to be a lovely morning in the midst of some heavy rain over that weekend. Over 250 trees, shrubs and small smaller plants were carefully planted , quarded and watered in. The ground had been prepared beforehand and the species carefully selected by the Garibaldi Environment Group who have been turning this area of woody weeds and shifting waterway into a wonderful habitat and picnic area for nearly ten years. 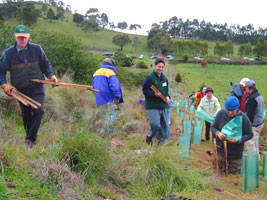 Upper Williamson's Creek Landcare also planted selected trees at the very top of Mount Buninyong, making sure they are protected from grazing wallabies. Based in Ballarat, BREAZE - Ballarat Renewable Energy And Zero Emissions Inc., is a locally formed group of energetic, forward thinking people who believe that there are more sustainable ways of living on our patch of the planet. See their website: BREAZE for more information about environmentally-friendly lifestyles and solar energy. Anglican Church Hall, 405 Scott St Buninyong.